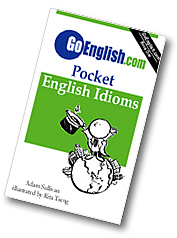 Today's Idiom = "Do An Errand"
Doing an errand is doing a small everyday thing that needs to get done and involves going someplace. Example: "Right now I am doing some errands, but I can meet you in a few hours." Typical errands you might do when you "do an errand" are going to the bank, stopping by the post office or shopping at the supermarket to buy things you need for daily use.